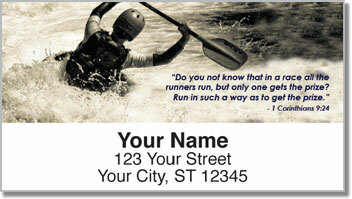 The New Testament of the Holy Bible often compares living life to running a race. As an athlete, you can identify with those similarities. There are times when your whole body hurts and you want to quit. As a Christian, you may also have times when you question your faith. It's not always easy to serve God. There are victories and defeats in both sports and in life. 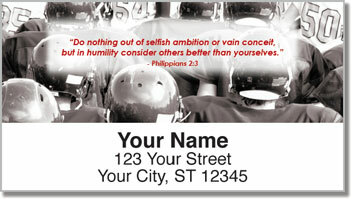 But being a Christian means you know that you'll be on the winning team when all is said and done. 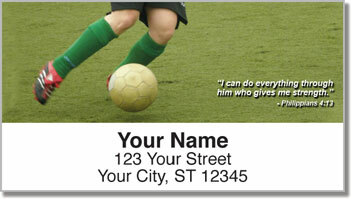 These unique address labels feature four motivational Bible verses along with sports photography. It's an excellent finishing touch for your letters and packages. Plus, the self-adhesive backing helps you save time. 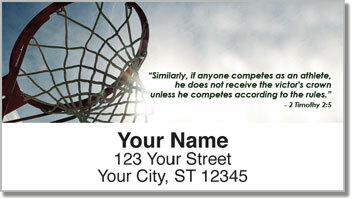 Get your very own Sports Scripture Address Labels right now! Order today with matching checks and get free shipping too.